There are two ways to slice strips of peel from the fruit: by halving and juicing first, or by cutting the peel off the whole fruit first. If you want the fruit juice for drinking, cut each fruit in half and juice each half, then use a spoon to scrape out all the remaining fruit pulp and membranes, leaving behind only the pith and the rind. If you want whole fruit sections for eating, use a paring knife to slice the rind around each fruit into quarters, then carefully pry the rind quarters away from the whole fruit. Slice the rinds into ¼-inch-wide strips. If the pith is very thick, slice some of it away from the rinds, but you want to retain some pith for two reasons: the pith makes for a thicker, chewier piece of candied peel, and its bitterness counterbalances the intense sweetness of the sugaring process. Prop a couple of wire cake-cooling racks over rimmed baking sheets. With a skimmer, scoop out the candied citrus peels and arrange them on the racks to cool. The excess syrup will drip off of them as they cool. Quickly roll the cooled strips in the extra 1 cup sugar until each strip is evenly coated. Shake off any excess sugar and let dry for several hours (preferably overnight) on parchment paper. 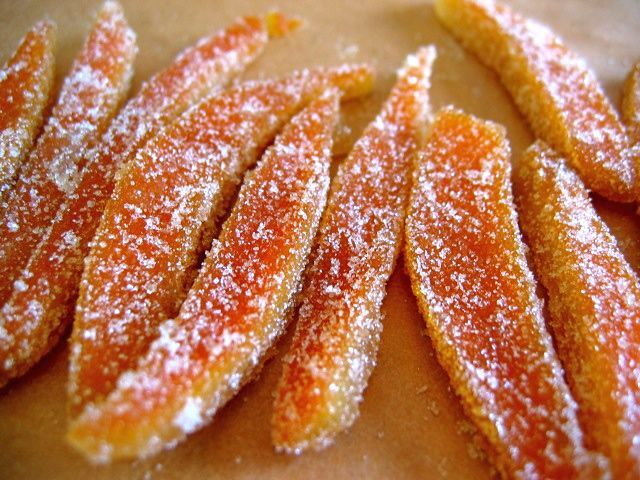 Candied citrus peel will last for a couple of weeks if stored in an airtight container. If you like, store the leftover citrus syrup for a few weeks in a container in the fridge and use it as a base for frosting or ice cream, or over fruit salad, pound cake, or pancakes. For a sweeter, more delicate treat, candy only the zest of the citrus fruit, not the pith. Cooking Light magazine has a visual how-to on making candied zest, which is excellent served over other desserts as well as by itself.